This November we bring you the most epic event of the year. "Battle of The Bands 2011"
One band to rule them all! One band will walk away with the epic trophy and the title: Master of Planet Music! We know what you all are craving for. Yes, A battle, The battle between the top music maniacs of Lahore. So fasten your seatbelts, unleash your souls, you shall see dancing fingers on the fretboards. We take you to the supreme and enchantic ride “The Music Parade”. Relax your muscles, because they wont be in your control on the day when the biggest bands collide. Headbangers get your souls straight. Surprises yet to come. So keep your fingers crossed. - 15 Bands will be short listed after consultation with the judges that would be taking part in this competition. - Bands will be divided into three groups which will be done by draws at the start of the event. - Top Three bands from each group will give final performances among which winner will be selected. 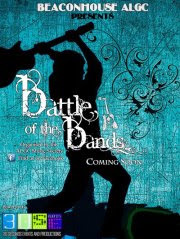 - Battle of bands is exclusively for the University and School students. - The decision by the Judges will be final and no objection call will be entertained. - Hold your breath because there is a lot more to come !!! Not only this but we il be having a Concert and After party by a famous DJ you all know . About the Concert : A Pakistani leading band would be performing LIVE till your spirits flow down!